Following on from considering how to dress a large politician, then a super skinny one, I will now turn my attention to a smaller man. And I have chosen Nicolas Sarkozy because despite his small stature (around 5’5″) he generally knows how to make the best of his shape. Also, being French always helps. They generally don’t have so much problem with style (ie they embrace rather than avoid it). It also seems that Sarkozy has a good tailor who ensures his suits fit well. Here he is trying to look taller than the Eiffel Tower. Sarkozy is broad of chest, fairly fit and has a glamourous assistant, who while around five inches taller than he is, enhances him greatly. Carla Bruni showcases French fashion with aplomb and poiise. With a close up of Sarkozy in his cycling gear (complete with perspiration) we can see he has a fairly long face, with a particualrly long brow. His hair is always beautifully cut and in place. The steel grey hair, with his deeper colouring and blue-grey eyes, and an ability to tan easily, implies that he has deep and cool colouring. Therefore he can wear deeper blues with ease. By combining them with a pure white shirt and a dark tie, he strives for maximum authority. For a smaller man, who will often meet other powerful men and women who “look down” on him, he needs to power up. For an extremely well groomed man it is interesting to find quite a few pictures of him “unshaven”. Is it possible that this small man wants to show the world that he is very masculine and strong? He can run, he can grow a beard, he can pull a pretty, taller lady, and impregnate her? I think this, as well as the emphaisis on athletic activity, is done to make the point that this man is all-male. If he was not a world leader I would suggest a slightly lighter suit colour, and less funereal tie. But Sarkozy can get away with the maximum contrast look so he invariably chooses this look. This is a man who understands image very well. To combat his short stature he wears footwear with heels, and will stand on steps or blocks to increase his height when required. Even when he doesn’t wear a business suit Sarkozy is always smart. I like this look. It appears he is wearing a cashmere jacket, flannel trousers and a nice pair of dark brown suede shoes. He has kept the colours deep, apart from the white shirt, and this gives a streamlined shape. So if you are a smaller man, what lessons can be drawn from Nicolas? “Being French always helps.” You’re very kind ! Isn’t it a myth though ? Hollande is not as nicely dressed I think. 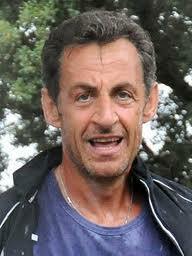 The first picture of Sarkozy is so him ! Have you seen the picture of Obama and Cameron today ? They are wearing the same outfit/coulours. Twins.